When you come to the end of the Santa Fe Trail you will find the Chapel of Loretto. This Gothic style chapel is an unusual site to find in the land of adobe architecture. It was during the late 1800s that a French bishop brought to the Santa Fe territory the Sisters of Loretto. The Mother Superior of this little group was named Sister Magdalen. Magdalen actually means tower. The sisters wanted to build a chapel for their school. The Sisters of Loretto were very resourceful, using their own inheritance money of $30,000. They hired two French architect Antonie Mouly and his son, Projectus Mouly from Paris. Antoine had been the architect on the restoration of Sanite Chapelle in Paris France, Saint Chapelle being one of the gems of Gothic architecture in Europe. It was built by Louie IX to house the relics of Christ. It is example of some of the best stain glass windows in Europe that goes from the floor to the ceiling. Antonie and his sons were experts for this job. The Chapel of Loretto was influenced by French design. The stain glass windows were made in Du Bois Studios in Paris and ship to Santa fe by steamboat and then bought by covered wagon. 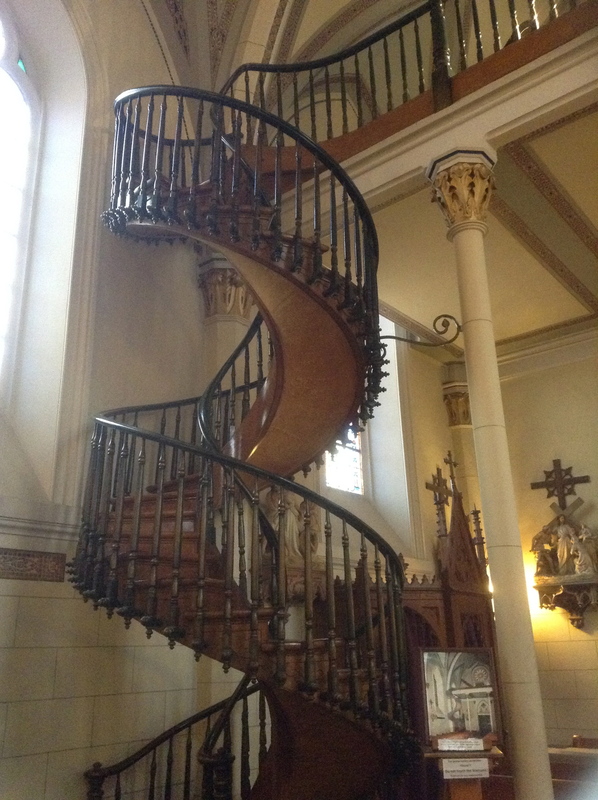 One of the mysteries of San Loretto is the miraculous staircase. The chapel was completed in 1878 but due to the sudden death of Projectus Mouly, he did not leave plans for the stairs to the loft of the chapel. The size of the chapel proposed a problem for carpenters to build a staircase and everyone suggested they would have to use a ladder. The Sisters of Loretto doing what nuns do best they made a prayer novena to St. Joseph for nine days praying for a solution for their problem. Legend tells us on the ninth day a man appeared on a donkey carrying with him a saw, a hammer and a T square and over the next 6 months this stranger built a spiral staircase 22 feet high with 33 stairs at a 360 degree angle with no supporting beams. Architects, carpenters and engineer are still mystified how this was accomplished. When the stranger finished the staircase he disappeared without asking for payment. The Sister of Loretto said it was a miracle of St. Joseph the carpenter. The height of the staircase 22 feet is the sacred number of the Master and 33 stairs is the number of years Jesus lived on Earth. Who were these nuns with such prayer power to manifest a master carpenter to create such a staircase? One of the aspect of prayer or co-creation with the Divine is to be clear and ask for what is needed, have trust that it is possible, be in alignment with the Divine Blueprint and then complete surrender and get yourself out of the way of the Divine Process. I want to take a moment to explore the linage of the Sister of Loretto which takes us to a village of Ancora, Italy. There in a the middle of the cathedral, the the stone house of Mother Mary of Nazareth stands. Legend tells us it was carried magically from Nazareth to Italy by heavenly angels. But the truth be known it was bought to Italy stone by stone by the Angelis family during the Crusades by boat in the year of 1294 . It was installed in Ancora cathedral in the 13th century. When you enter this house of Mother Mary what you will find is a Black Madonna, “Our Lady of Loretto”. 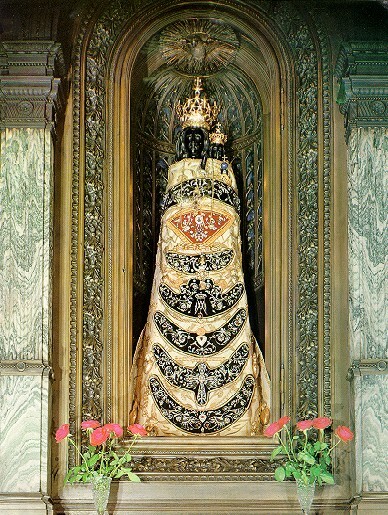 Black Madonnas are a very powerful aspect of the Divine Mother. The Seat of Wisdom was the title of both Isis and also the Goddess of Wisdom Sophia’s. Wisdom Sophia was there at the very beginning of Creation. If we explore the title, “The Tower of Ivory”. history points to the Medieval Alchemist who used ivory in their transformation process. They would place white ivory in an enclosed vessel and the calcination process rendered a black pigment that was used for paint. This same process symbolically happens for every soul that is on the “Spiral Staircase of Awakening” We are asked to enclose ourself and to look within. We make the journey into our own inner chamber of darkness to bring the unconscious to light. This is the Alchemical process of Awakening Up. This is the lineage of all Black Madonnas and the lineage of our Sisters of Loretto of Sante Fe, New Mexico who prayed to St. Joseph to create a Miraculous Staircase.